I remember when John was first born, and I was struggling with the Down syndrome diagnosis, I bought all the books, visited all the websites, searched for positive information. I was looking for something to convince me that life really would be ok. We already had two bright, beautiful, healthy daughters, and we were very concerned what effect having a brother with Down syndrome would have on them and to be honest, us. One of my favorite books at that time, that answered my questions and soothed my fears, was Common Threads, Celebrating Life with Down Syndrome. This book, filled with anectodal stories and photographs of children with Down syndrome, was exactly what I needed. I needed to hear from parents because they truly are the experts. A quote from the book especially reassured me. It went something like this: "Down syndrome won't be the most interesting thing about your child." 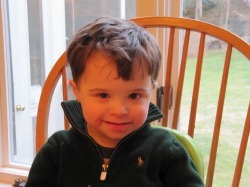 Over the past three years since John entered our lives, I have asked myself what about him is more interesting than Down syndrome. In the beginning, the Down syndrome really seemed all encompassing. We did not have a prenatal diagnosis, nor did we know that our child would also be born with a heart defect that require open heart surgery. Yes, in the beginning the Down syndrome, and the heart defect, seemed to be the most interesting thing about John. I kept waiting for the weight of the diagnosis, and all it might bring, to fade. Well, John is showing us the way. Thankfully, his heart defect was successfully repaired when he was 5 months old. He began receiving Birth to Three services when he was 6 weeks old, and slowly he began to show us that there was more to him than that extra 21st chromosome. He showered us with kisses, and treated us to smiles. He learned sign language, and surprised us when he could tell us the sound each letter of the alphabet made. He knows his colors and basic shapes. He can count to twelve and can say his version of the alphabet (instead of saying the letter, he sometimes says the sound.) He loves the swings and being outside, but he is a bit of TV junkie like his sisters, turns out he is a big American Idol fan. He loves books, music, and watching his sisters play Wii. Pizza is definitely his favorite food. He is three years old, and currently goes to an integrated preschool 4 days a week. He even rides the bus all by himself. As far as his two older sisters, he has them wrapped around his finger. Their friends all think he is the cutest thing. He has had such a positive effect on their lives. Seeing my three children together, makes the words "unconditional love" come to life. I am supposed to be teaching them, but they are my biggest teachers. Yes, the delays are there. He was a late walker and his speech is delayed. He has some words, but really isn't talking. I know the speech will come, but the waiting for the milestones is hard. The worry about the future is still there. 21 Strong began out of friendship. A group of moms, brought together our children's Down syndrome, wanted to create a place for others to turn. Together, we are convinced, we will make a better world for our kids, and have a bit of fun in the process.